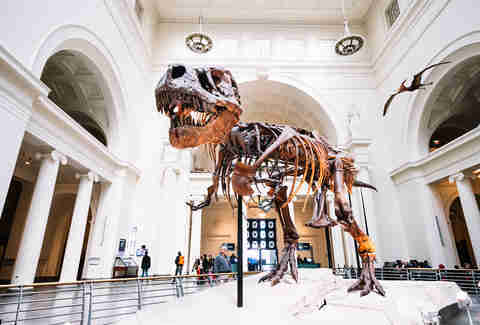 Manhattan, though it might seem small sometimes (like when you’re looking for apartments or wading through a crowded Thursday happy hour), is a wildly complex city filled with countless experiences to be had. And since we know you can’t have them all (walking from one end of the island to the other would take about seven hours and that doesn’t include a pit stop for dim sum), we compiled a list of your must-hits. From top to bottom, here are 13 of NYC’s best cultural experiences. Anyone who’s read a textbook on New York City will tell you to visit the Metropolitan Museum of Art. Its Fifth Avenue building houses works spanning over 5,000 years, including paintings by Claude Monet, Edgar Degas, and more. But there’s a lot more to be seen. About a 20-minute drive uptown from that Met you’ll find The Met Cloisters, located in Manhattan’s Fort Tryon Park. 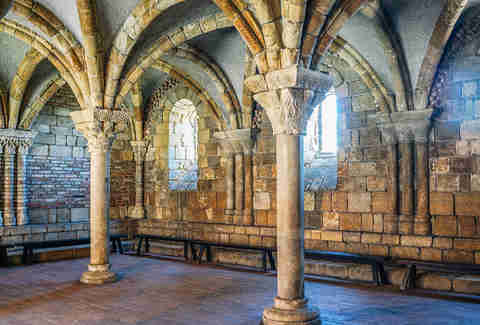 Dedicated to European medieval architecture, sculpture, and decorative arts, The Cloisters’ name comes from the four cloisters (covered walkways/open galleries) that form the building. The cloisters themselves -- Cuxa, Bonnefont, Trie, and Saint-Guilhem -- were sourced from French monasteries and abbeys and brought from Europe in the 1930s. At their home in Washington Heights, their new job -- to protect works of art dating back to the 12th century -- is, while certainly less religious, just as important. Located on the first floor of Harlem’s Cecil Hotel, Minton’s Playhouse (founded by tenor saxophonist Henry Minton in 1938) is considered the birthplace of bebop, and where modern jazz took form. Before it moved to a new location right next door, the likes of Duke Ellington, Charlie Parker, Miles Davis, Billie Holiday, and so many more played at Minton’s. The original club closed in 1974 and, after one failed remodeling and reopening, the new Minton’s has been successfully operating since 2013. Drop in for a show and a meal (the expansive menu includes crab cakes, Chilean sea bass, and more) and feel instantly transported to the 1940s as you sit among photos of the original performers that adorn the walls. From a distance, Cleopatra’s Needle looks like nothing special -- an indecipherable statue made of brick or concrete. But take the time to get up close. This 69-foot, 220-ton granite monument was commissioned in 1450 BC by an Egyptian pharaoh who wished to celebrate his 30 years in power. Part of a pair, the two obelisks (stone pillars) were later separated, and in 1880, one arrived in New York City, while the other ended up in Westminster, London. If you enter the park from 5th Avenue and 79th Street and head west, you’ll reach Cleopatra’s Needle in minutes. On it, hieroglyphics dating back to ancient Egypt are still visible, though New York’s acid rain and pollution have made them more difficult to interpret. This is why we can’t have nice things. NYC is nothing without its arts and entertainment. It’s why so many aspiring actors, dancers, singers, and comedians move here, and why so many people visit -- if just for a few hours, to be a part of New York’s theatrics. A great place to be a part of it all is the New York City Ballet, which has been an integral part of the city’s culture since the ballet was established in 1948. 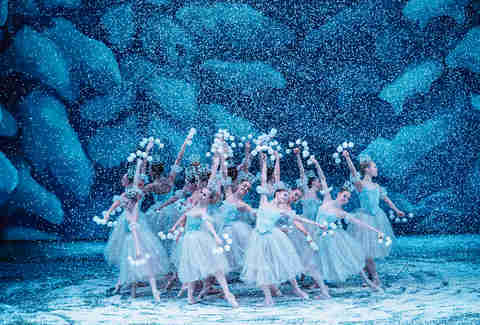 Beginning November 24, it’s Nutcracker season, so snag tickets to George Balanchine’s The Nutcracker. Balanchine co-founded the NYCB and served as its artistic director for 35 years, and his rendition of Tchaikovsky’s famous melodies, toy soldiers, and mice come to life with this original choreography -- the way the New York City Ballet’s always done it. You don’t need to be an artist to get into this society; the museum is free to the public. Founded in 1901, the Society of Illustrators’ mission is to “promote the art of illustration, to appreciate its history and evolving nature through exhibitions, lectures, and education, and to contribute the service of its members to the welfare of the community at large.” Anyone can enjoy the museum and its exhibitions, including works from Larry Lieber (The Amazing Spider-Man), Joe Staton (Scooby-Doo), and Craig McCracken (The Powerpuff Girls). Or you can buy tickets to events, like a Q&A session with legendary New Yorker illustrator George Booth. 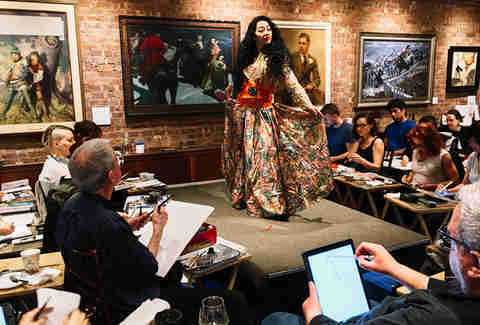 If you’re more of a doer, stop by on a Tuesday or Thursday evening for Sketch Night. Who knows, maybe you’ll discover a talent you never knew you had. You won’t believe how much art, and how few people, you’ll see on West Broadway between West Houston and Spring Street. 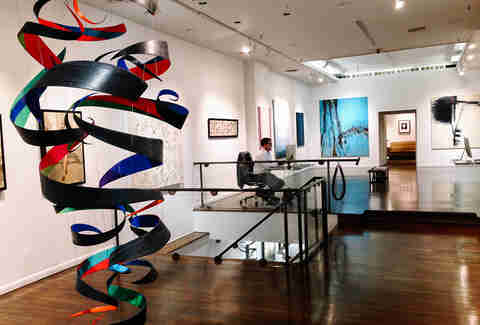 On these two city blocks alone there are 17 art galleries filled with paintings, sculptures, photography -- you name it. 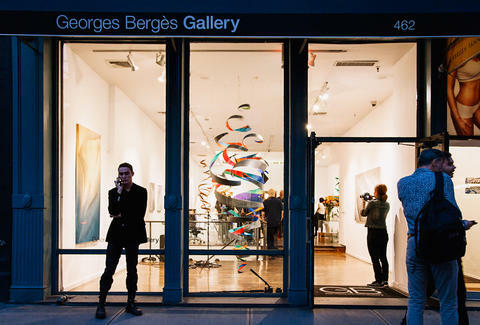 Martin Lawrence Galleries (457 W Broadway) boasts a huge collection of Andy Warhol works, paintings by Pablo Picasso, Keith Haring, and others, while across the street at George Bergès Gallery (462 W Broadway), see what the future has in store by checking out contemporary artists from all over the world. The best part? Aside from these galleries not being crowded, they’re also free to the public. And while you’re in the area, it can’t hurt to swing by the legendary Dominique Ansel Bakery on Spring Street. If there aren’t Cronuts left that day (which is a common occurrence for the sought-after pastry), fear not: the shop specializes in modern takes on Parisian classics like mini meringues and more. You won’t leave empty-handed. No need to deal with the chaos (and the scary Elmo and the Naked Cowboy) of Times Square to see an incredible stage performance in New York City. Instead, head to the acclaimed Public Theater. Founded in 1954 by producer Joseph Papp, this arts organization has been showcasing works from new and known playwrights since its inception. The venue opened in 1967 and has since developed a reputation for putting on shows that go straight to Broadway, win a million Tony awards, and then sell out for the rest of forever (like Alison Bechdel’s Fun Home and a little under-the-radar production called Hamilton). Now through December 10, stop in to see Illyria, the story of Papp himself, or Tiny Beautiful Things, based on the book by Cheryl Strayed (Wild), and directed by Thomas Kail (Hamilton). If you catch the latter, we’re told you’ll need to bring some tissues for this Nia Vardalos-starring (My Big Fat Greek Wedding) production. 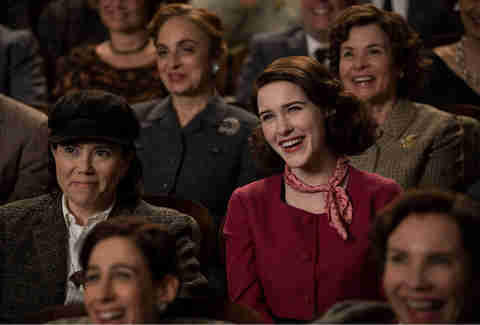 Go inside both of New York's vastly different neighborhoods in the new Amazon Prime Original series, The Marvelous Mrs. Maisel. From the creator of Gilmore Girls, the series is about a fearless woman in 1950s Manhattan who goes from perfect housewife to stand-up comic after her life takes a sudden turn. Stream it starting November 29 on Prime Video. Sure, most of what you see in New York is cement sidewalks and skyscrapers. But we’ve got nature, too. Just maybe not in the way you’re used to. Walk into 141 Wooster Street and you’ll find a sculpture of sorts known as The New York Earth Room. Installed in 1977, Walter De Maria’s 3,606-square-foot loft filled with dirt is a piece of land art (a movement that emerged in the 1960s and ‘70s that uses materials from the earth to create works). Since De Maria’s death in 2013, caretaker Bill Dilworth has been watering, weeding, and raking the dirt weekly, and watching the reactions of every patron who visits. In 2016, he told Australian magazine Traveller he senses the irony. “It’s a big loft in Soho, where people are money-crazed. New Yorkers are desperate for space, then they walk in and see this big space filled with earth.” But regardless of whether or not people get it at first, it’s a sanctuary in this crazy city. 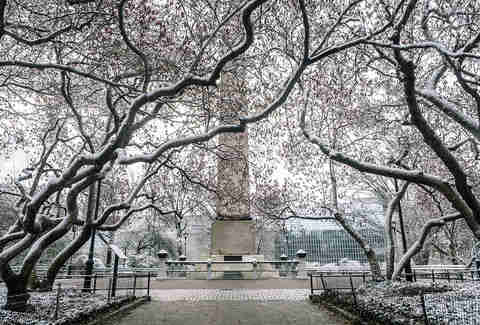 “It’s one of the quietest places in Manhattan,” he says. In a city of 1.6 million people, you’re surrounded by strangers everywhere you go. You don’t ask how they’re doing, where they’re going, or what’s going on in their lives. You just go about your day. 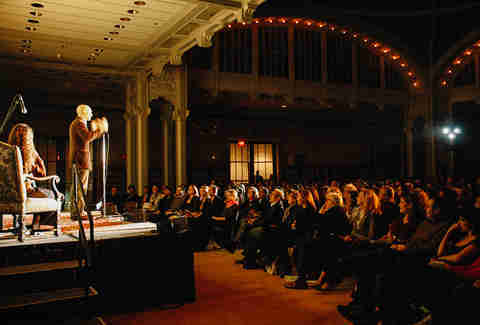 At The Moth, a nonprofit organization where live storytelling and the human experience are celebrated onstage, you don’t have to ask. Buy tickets to a live event and participate as either an audience member or a storyteller (but remember, no notes allowed and pieces can’t exceed five minutes in length). Every event has a theme; in December those themes are “dirt,” “obsessions,” “rules,” and “silver lining.” Performers are chosen at random (if you write your name down, of course), and a winner is awarded at the end of the evening. After 10 events and 10 winners, The Moth holds a GrandSLAM with the champs. If you want to experience New York City and some of the actual people who call it home, this is the place to do it. You have to travel to the island’s southern tip to take a ride on the magical SeaGlass Carousel. Opened in 2015, the $16 million attraction took an entire decade to complete, thanks in part to Hurricane Sandy halting production. But this isn’t your ordinary amusement park ride. 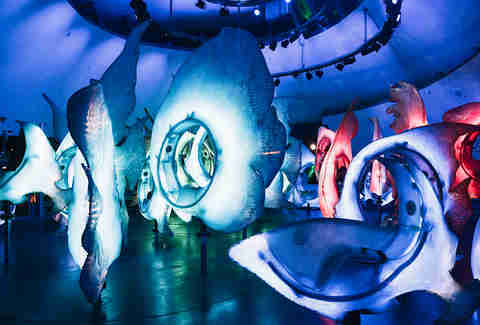 Its 30 fish -- including angelfish, Siamese fighting fish, and more -- were custom designed, constructed from fiberglass, and are illuminated from the inside out by color-changing LED lights. Once inside, LED lights and projectors make you feel like you’re underwater (prettier water than the Hudson River, don’t worry). A three-minute whirl will run you $5 -- worth it for the social media content alone. You’ve seen her from countless rooftop bars in Midtown, and maybe caught a glimpse of her through skyscrapers, but we say it’s time to go see the Statue of Liberty up close. (She’s been waiting for your visit since 1885, after all.) And not only is the trip super easy, it’s inexpensive. Book yourself a Statue Cruise and get picked up and dropped off at Battery Park for just $21. Plus, a Crown Reserve ticket gets you an audio tour, access up to the Statue of Liberty Monument, the Ellis Island Immigration Museum, and you get to tour her crown. Wait, why aren’t we doing this every weekend?